"This is a significant improvement for the citizens of the Republic of Serbia that during submission of a large number of requests they do not have to attach supporting documents with the data that the administrative bodies already have in their records. This was discussed and argued over a very long time, especially in the Diaspora, and with this law it finally became a reality. The law has forced the government authorities to mutually exchange information from the official records, thus relieving citizens from obtaining documents, as well as free the citizens and administration from excessive and unnecessary procedures. In practice this means that the citizens of the Republic of Serbia while submitting an application for a passport no longer have to submit documents such as the proof of citizenship or excerpt from the registry of birth. This information will be officially obtained by the competent authority to satisfy requirements for the issuance of passports. An applicant for a new passport is required to possess an identity document such as previous passport or identity card. In addition, at that time an applicant needs to sign a statement agreeing that the above data should be obtained through official channels. In this way, the citizens, especially those residing abroad, will be greatly facilitated when applying for a passport, since they will no longer have to obtain required documents from the country and will thus save time and money since they will not have to pay a fee for the issuance of the above documents. The law estimates a period of fifteen days to obtain the documents through official channels, which would naturally reflect in the total time saved in the resolution of submitted request. Very often we are contacted by our citizens who came to the United States several decades ago and do not have any of the documents issued by the Republic of Serbia. Often, many are not even sure whether they even are citizens of Serbia in general because they left the country at the time of the former Yugoslavia. The consulate will provide assistance to all citizens who turn to us in order to establish the facts, particularly those relating to citizenship. 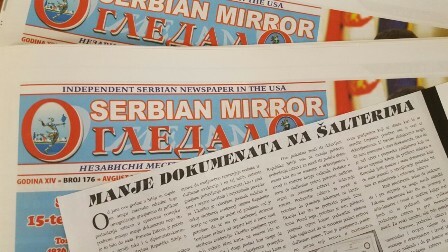 In such cases even old documents can help us so that our advice and recommendations to the citizens who have left Serbia long ago is that upon arrival at the consulate they still bring us the old documents which will help us in the identification of relevant data for submission and resolution of applications. It is the right of every citizen to independently decide whether the documents will be obtained by him/her or will opt for the competent authorities to do that for him/her. Obtaining the information through official channels also applies to other consular services such as registering birth of children, registering marriage and requirements regarding the citizenship of the Republic of Serbia. "